The Translational Research in Respiratory Diseases Program (RESP) builds upon the success of the Meakins-Christie Laboratories and the Respiratory Epidemiology and Clinical Research Unit to further bring together basic, clinical, population health and outcomes researchers in both adult and pediatric medicine. 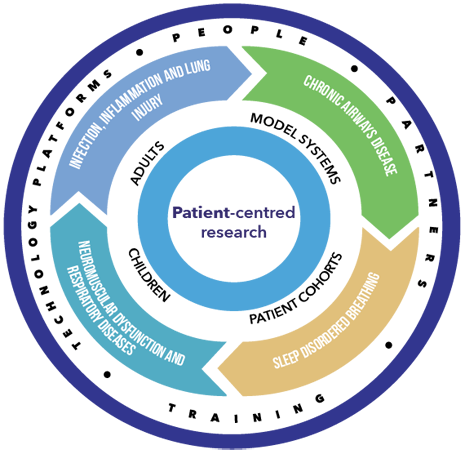 The program is organized around four primary research themes: chronic airways disease, sleep-disordered breathing, neuromuscular dysfunction associated with respiratory disease, and pulmonary inflammation and infections. RESP researchers recognize that an interdisciplinary approach is essential for understanding and ultimately better diagnosing as well as treating conditions such as asthma, chronic obstructive pulmonary disease (COPD), sleep apnea, tuberculosis, cystic fibrosis and neurological or musculoskeletal diseases affecting the respiratory system. Our researchers benefit from the state-of-the-art technology platforms available at the new RI-MUHC facilities, such as the Molecular Imaging and Histopathology Platforms, as well as being equally well-equipped to conduct high quality clinical trials and outcomes research through the Centre for Innovative Medicine (CIM) and the Centre for Outcomes Research and Evaluation (CORE).